The Wehrmacht was famous for the fact that on the battlefield, everyone, regardless of class ate the same food. Those rations consisted of basically the same elements that were eaten back in the homeland: bread made of wheat and rye, pork (mainly sausages), and potatoes. In fact, the staple diet of the Wehrmacht was a nutrient rich stew made by mixing all of those ingredients together. Piping hot coffee was also available, making even the most frightening battlefield feel a little more like the home. Distribution of these rations required the "Grobe Feldkuche Hf.13", a two-wheeled field kitchen, the center of which housed a 200 liter pot. That stew-cooking vessel was double-bottomed, with a layer of glycerin between the inner and outer pot to prevent scorching and to aid in heat preservation. To the left of the pot was a 90 liter coffee maker, which dispensed from a tap. On the right was a range used to cook potatoes and sausages. Fire doors for each of these appliances were on the rear for the stoking of coal and firewood. 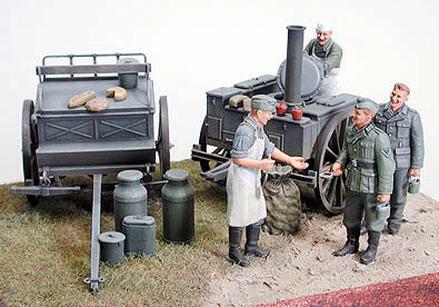 The front of the field kitchen was the "Vorderwagen Hf.11", a two-wheeled limber, which in addition to seating members of the cooking crew, had a food storage space below the seats and carried the "Speisentragen" food containers. Each Wehrmacht division consisted of baking companies (for bread) and butcher companies (for pork). There, bread was baked in oven trailers and pigs were made into sausage before being supplied to the various units. A single "Grobe Feldkuche Hf. 13" could feed 125 to 225 men.